NfR Sri Lanka, a network of Sri Lankan journalists and human rights defenders living outside the country, condemns the falsification of the proceedings of a side event organized by Sri Lankan Mission in Geneva, to intimidate Sri Lankan press freedom and human rights campaigner Sunanda Deshapriya. He has been a leading activist and a former convenor of the Free Media Movement. Sunanda Deshapriya is a founder member and a steering committee member of the Networking for Rights in Sri Lanka. He is associated with number of other national and international human rights organizations. NfR - Net working for rights in Sri lanka - Exile network for media and human rights in Sri LankNfR Sri Lanka, a network of Sri Lankan journalists and human rights defenders living outside the country condemns the brutal assault on civilians by the officers of Navanthurai Army Detachment, in the Jaffna district. The assault took place on the night of 22nd August 2011. At least 18 of the arrested civilians have been tortured badly and had to be hospitalized. Photographic evidence published by reliable online media sources indicates that many of them having plastered arms and legs. President Mahinda Rajapaksa announced today (Aug. 25) that the state of emergency has been lifted. In a special speech in Parliament, the president said he had continued with the emergency rule only for curbing terrorism. Since the normal law can ensure the country’s administration, he said he was submitting to the House a proposal for lifting the emergency. “If you are not with the government, you become an instant traitor to the country. They said I should be killed; very clearly, they said I should be killed.” In his 30-year career as a reporter and editor in Sri Lanka, Sunanda Deshapriya says he was non-political, but his reporting on the 25-year civil war and human rights violations in the country rubbed the government the wrong way. “I can only bring you Thambili in hospital’, says Media Minister . Media Minister Keheliya Rambukwella said that he can only bring a thembili and visit any journalist if they are assaulted and admitted to hospital. “I do not have powers to take police action. I cannot also give orders to the police to carryout investigations or arrests”, Mr Rambukwella said at the weekly cabinet newsconference when he was questioned about the investigations on the attack on the Uthayan news editor G.Kuhanathan. Already battered Freedom of expression and media rights took yet another ugly turn last month in Sri Lanka. A leading news paper owner was threatened by the President, the news editor of the largest circulating Tamil daily in Jaffna was assaulted and critically injured by the military backed para military gang and two correspondents of popular TV news channel was harassed by supports of a notoriously anti media Minister. 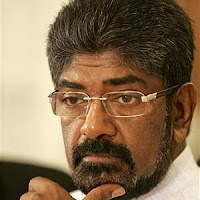 The International Federation of Journalists (IFJ) joins its Sri Lankan affiliates in expressing outrage at a brutal attack on Gnanasundaram Kuhanathan, news editor of the Tamil daily Uthayan, in the northern city of Jaffna on July 29. Blood was dripping from the head of Uthayan news editor Gnasundaram Kuganathan as he came home shouting in pain after two men had brutally attacked him, stated the Jaffna based Uthayan newspaper, quoting his wife. An ethnic Tamil journalist in Sri Lanka’s formerly embattled north was brutally attacked with iron bars, police said on Saturday, the latest in a string of assaults on the nation’s media.Gnanasundaram Kuhanathan, news editor of the Tamil-language daily Uthayan, was attacked by a gang of men wielding iron bars on Friday near his home in the area formerly held by separatist Tamil rebels, police said. 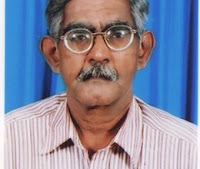 Two unidentified men who came in a motorbike attacked the Chief News Editor of Uthayan Daily in Jaffna, Gnanasundaram Kuganathan, Friday around 7:45 p.m., causing serious injuries to the 59-year-old news editor. 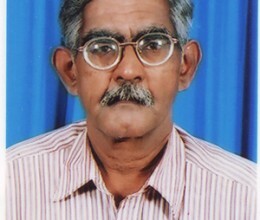 Till the end of war, Mr. Kuganathan was living inside the paper office for 3 years as the news paper had come under attacks by occupying SL Army-backed operatives in May 2006 and in March 2009. The staff at the paper office have been threatened by the EPDP paramilitary on several occasions. 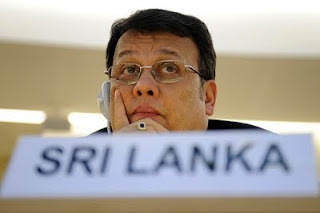 The timing of the attack signals that it was a ‘punishment’ by the SL military intelligence not favouring the ruling UPFA alliance during the campaign for civic elections. Some of the recommendations already implemented include the reduction of High Security Zones, the closure of the Omanthai detention centre, the release of a large number of ex-combatants, the resolution of land disputes and the swift steps taken to ensure that no groups carry firearms with a deadline for the surrender of illegal weapons. 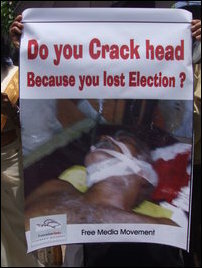 A recent assault on a journalist from Jaffna, yet another example of lawlessness in the North. NfR views the recent incident of assault on journalist S.Kavitharan of Uthayan newspaper in Jaffna as another example of the absence of law and order in that part of the country. What is prevailing in the Jaffna Peninsula is the rule of the jungle instead of rule of law. 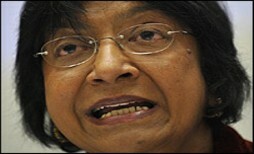 News Nowlk- Sri Lanka has accused the UN High Commissioner for Human Rights Navanethem Pillay of having ignored the relevant rules of procedure of the UN Human Rights Council by attempting to legitimize the report of the UN Secretary General’s Panel of Experts on accountability in Sri Lanka. Reporters Without Borders, the Committee to Protect Journalists, Cartoonists Rights Network International, International Media Support and the International Federation of Journalists released a joint letter today urging United Nations secretary-general Ban Ki-moon to support Sandhya Eknelygoda’s battle to find out what happened to her husband, Sri Lankan cartoonist Prageeth Eknelygoda, who went missing more than a year ago in Colombo. NFR Sri Lanka. Powered by Blogger.